St Laurence O’Toole Church, Broadmeadow has a unique history. Since the days of the well-known and much loved Fr Flanagan, and later Fr Anthony Stace, Broadmeadow has been a close community. Over the years, it has become a community that welcomes other cultures – the Polish, the Italians, the Vietnamese and the Aboriginal people. St Laurence O’Toole’s Church is home to our Italian Community, comprising the people who migrated to Australia and settled in the inner Newcastle area, chiefly around Broadmeadow and Hamilton, and mainly since the 1940s. From 1957 until 2002 the Scalabrini Fathers ministered to the Italian community at Hamilton. In 2002, Cardinal Cassidy generously took this role during his retirement, until ill health forced his permanent retirement in 2016. The Italian community is currently cared for by one of the retired priests of the Diocese. 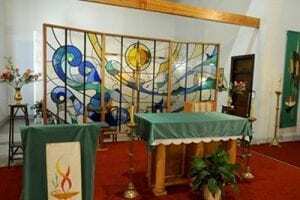 As you enter the Church, your attention is immediately drawn to the beautiful leadlight glass screen which separates the Sanctuary from the Blessed Sacrament Chapel. Designed by Sr Dorothy Woodward rsj at the request of Fr Anthony Stace in conjunction with repairs needed after the December 1989 earthquake, the screen uses the universal symbols of light and water, Australian symbols of the sun, sea, and earth and the Symbols of Initiation, Eucharist and Baptism. As the light of the day and evenings changes, so do the moods and impressions within the whole piece and certainly welcomes comfort for the viewer. On 17 July 1904, Bishop Murray blessed and opened a new Church-School and dedicated it under the title of St Laurence O’Toole. The Church was in use from that time, and Mass was celebrated weekly on Saturdays at 7.00am. From the beginning of 1905, the Sisters of Mercy commenced classes at the School with an enrolment of 86 students. The sisters walked daily from their convent in Hamilton to the School. The Broadmeadow area was originally part of the Hamilton Parish before becoming attached to Waratah Parish in 1917. It was during this time that the present St Laurence O'Toole Church was built and opened in 1933. In 1939 Broadmeadow became a Parish in its own right. Laurence O'Toole was born in County Kildare, Ireland in 1128 and died in Normandy on 14 November 1180. In 1166 he was consecrated the first Archbishop of Dublin. He was a fearless upholder of the rights of the Church. He attended the Third Lateran Council, reformed the Canons of Christ Church and was an important intermediary between the Norman invaders and the Irish. His feast day is 14 November.